The room turned out so fabulous, even I want to move into it! I need to give a special shout out thanks to The Paint Studio at Ace for their amazing colors and paint! Ace is having a Star Spangled Instant Savings Sale July 2nd – 7th and offers Instant Savings of $5 off Clark+Kensington and $5 off Valspar paint. You can connect with Ace here: Facebook, Twitter, Pinterest, Instagram, The Paint Studio, YouTube. Want the look? 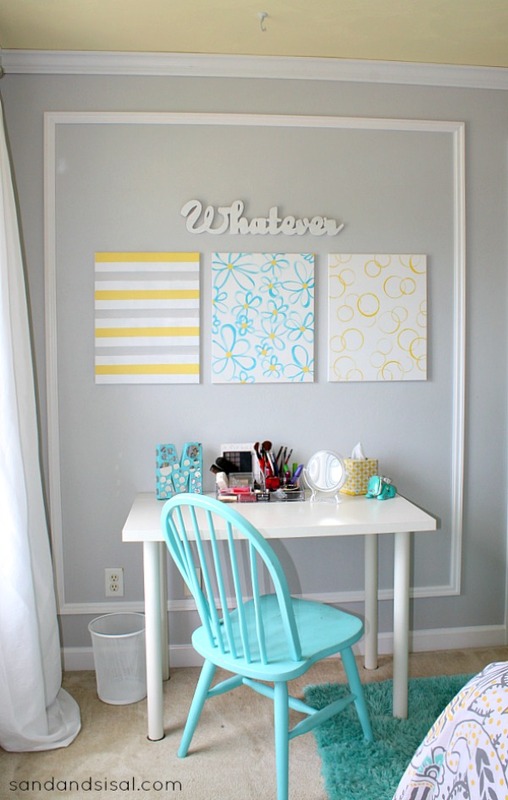 Click here for the Teen Room Makeover’s Source List for all the items in the room. Disclosure: This post has been brought to you in sponsored partnership with Ace Hardware. All opinions and positions expressed are my own and do not necessarily reflect those of Ace Hardware. Wow, what a beautiful room! 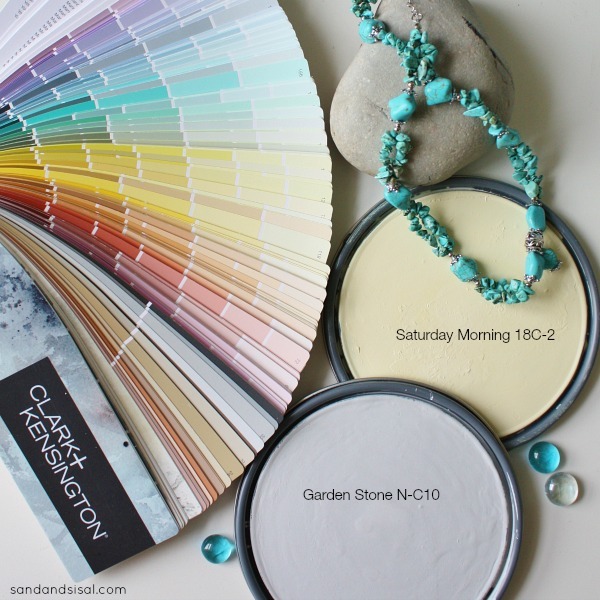 Not only is the color palette beautiful but I can’t believe it’s the same room size wise! It’s looks at least a quarter larger than before! Great job! I too was totally shocked at how large the room looked! We love how it turned out! I love the makeover! The colors you used are so pretty. This room looks so much larger now! What a beautiful new room for your daughter Kim. Luvly colour palette, very sophisticated , yet youthful at the same time. love the way the room turned out. hard to believe it was the same room from where it first started. i hope she will enjoy it for many years. 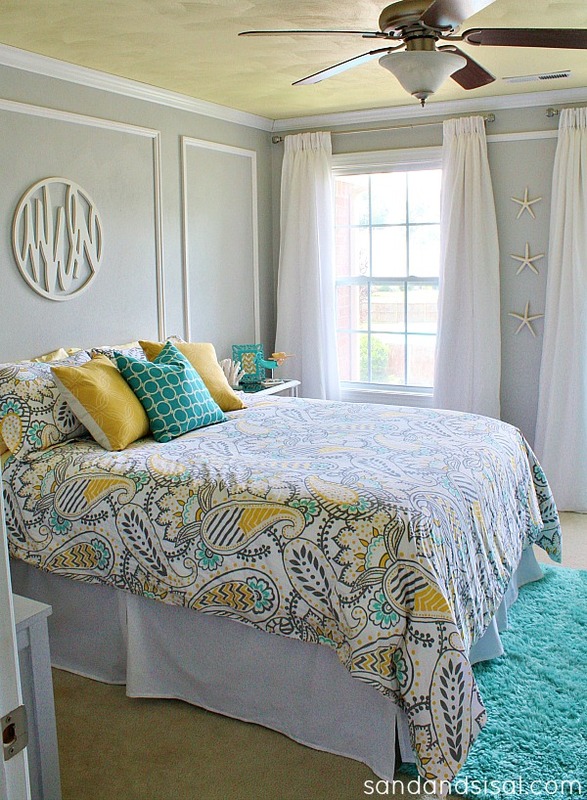 Love the quilt/bedspread!! Did you buy this or make it? Wait, what????? My teen daughter asked for this color combination about a year ago, and I said NO WAY! In my defense, her inspiration came from a very ugly lampshade we saw at Target, so I just had that in my head. Now I see your daughter’s room and realize the narrow-mindedness of my opinions. Heck – the kid might get her wish after all! It’s beautiful!!! 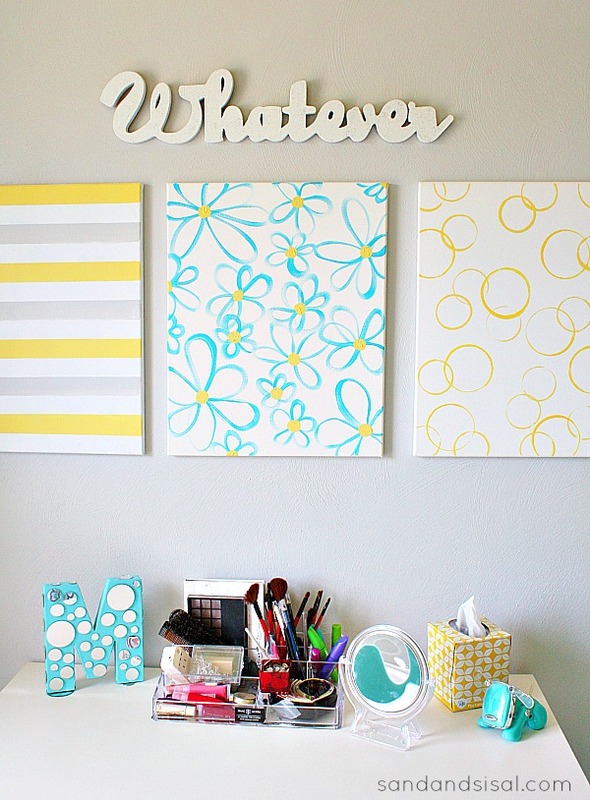 such a fun space- so cheerful! It’s beautiful, Kim. Light, bright & fun! I really love the color palette. Thank you Gina! I’m so very pleased with how it turned out. Have a fabulous week! So pretty and fresh! What is the round (wood?) 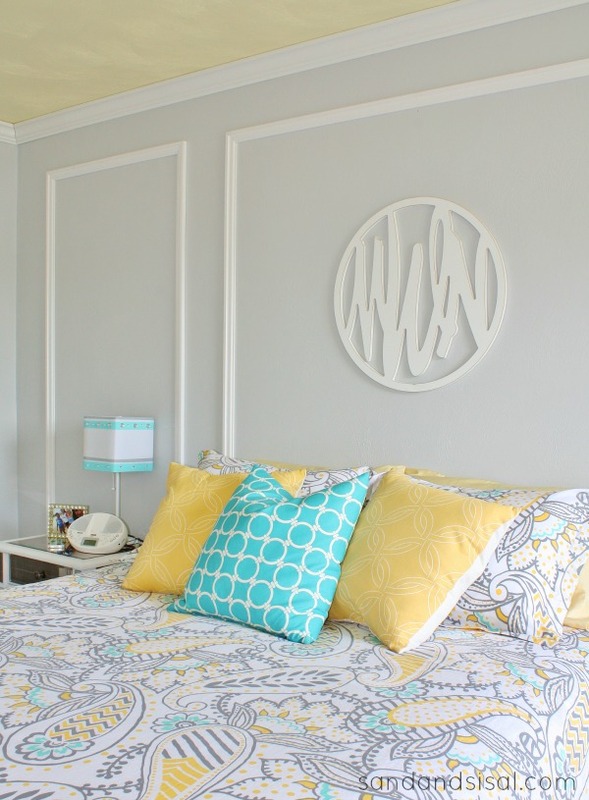 decor over the bed? At first glance I thought it was a monogram, but I guess not. It’s charming. Thanks so much! Yes, you were correct, it is my daughter’s monogram “MWN”. It is from Pottery Barn Teen. Absolutely fabulous makeover! Love the color combination! The room looks so much bigger! Thank you so very much Ashley! I was so shocked at how much larger the room looked too! Color is an amazing thing! Absolutely fabulous! The colors make the whole room look coordinated and relaxing. Don’t you just love it when things come together so well? Kim this is just beautiful! 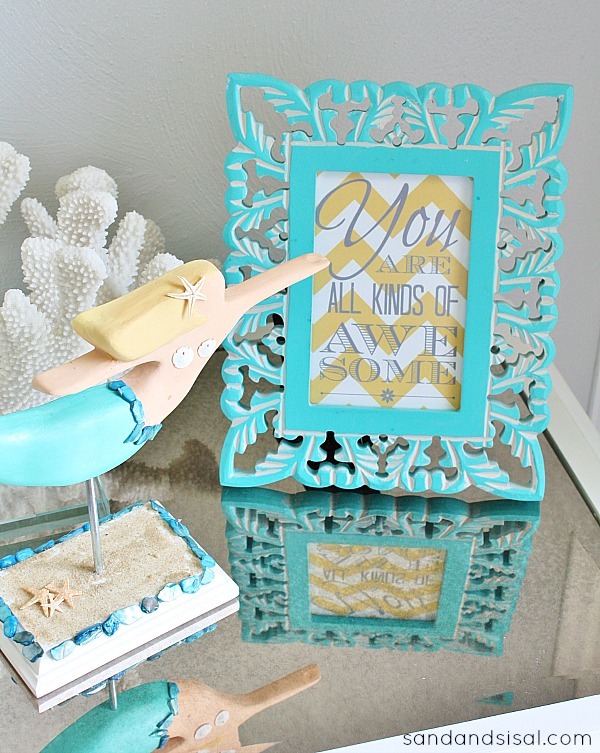 I love the aqua and yellow combo!! Pinned! Beautiful makeover! I like the fresh, youthful feel, but like you said, it’s a little more sophisticated. It looks so much bigger too and it’s just perfectly color balanced. Love it!! Such a happy room! Love the paint colors. Thanks Vidya!!! We love it! Love this space! I agree – I would totally want to move in as well! Way to go Ace for having awesome colors! I know we don’t know each other but can you please adopt me? Whoa! Both of those rooms are gorgeous! 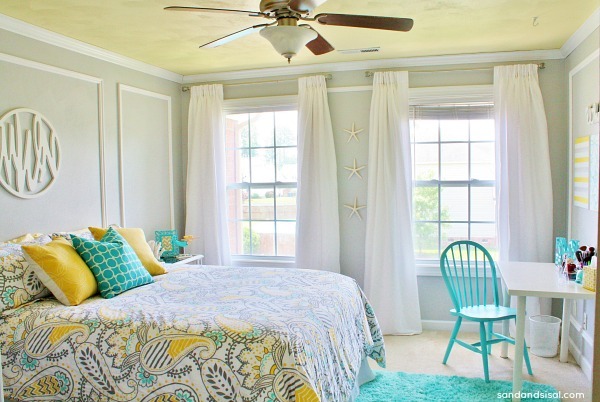 I love how this new room is youthful but still classy and sophisticated at the same time! Haha! Thanks Sharon! I’m super pleased with how it all came together! This is stunning! It’s so crisp and inviting! Do you mind sharing where you found the comforter? My daughter loves those colors and we’ve been looking everywhere (with little luck) to find something that pretty! Thanks! This is amazing – I would have died to have this as a teen! Beautiful! Teen…I’d love it for myself! Ha! I know, right?! Me too! Thanks Debbie! Gorgeous! 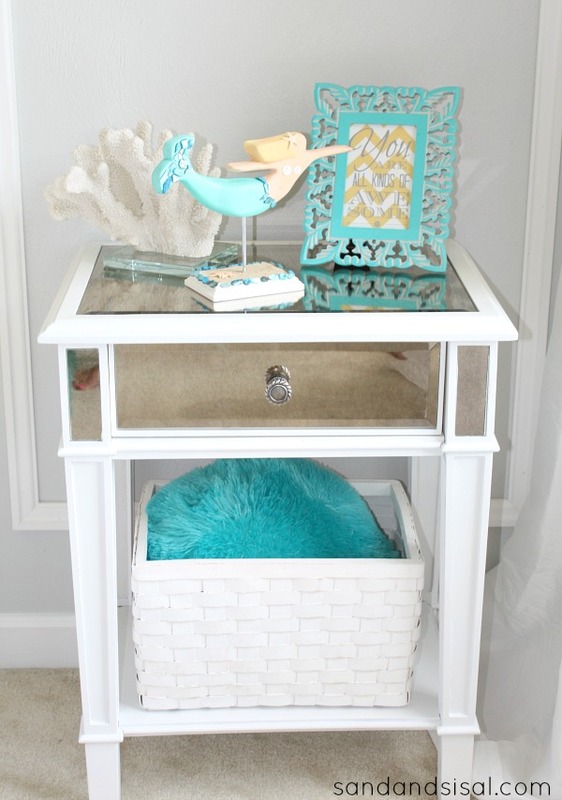 Love the colors and the mirrored side tables! She has great taste! Thank you! We love how it all turned out! Kim! I love everything about this room! Night and day difference and the paint color on the wall is perfect! It is a huge difference! Thanks so much!!! Hee,hee! Thank you! I’m not sure she is sold on the yellow ceiling but it’s going to have to stay that way for awhile. (I love it!). 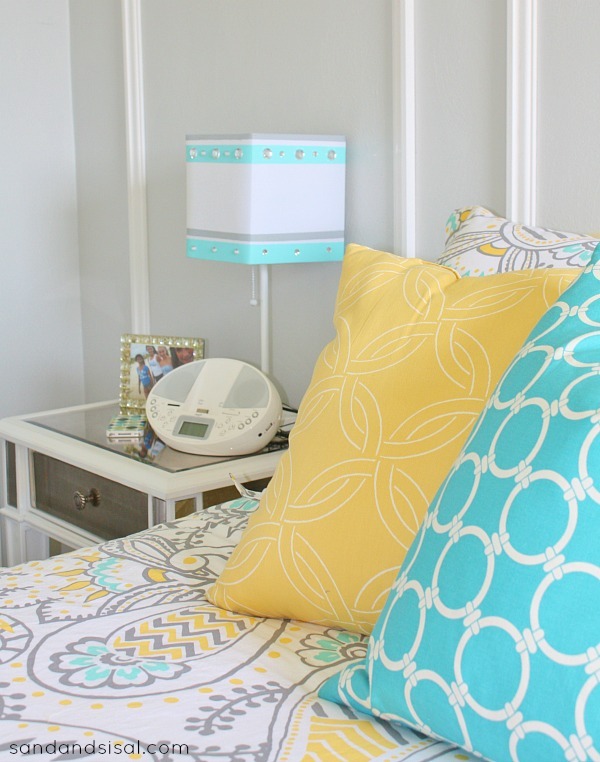 LOVE the way her room turned out Kim…BEAUTIFUL!! Her room turned out so well, Kim! It looks sophisticated but still lots of fun. I’m glad to know about the paint–I’m pretty picky about paint, and there’s an ACE hardware just five minutes from my house! I too am a self confessed paint snob and I was SO impressed with the Clark+Kensington! Their semi-gloss won awards so I’ll have to give that a try sometime too! WOW! That is amazing – a beautiful space! Love the paint you picked out! Thank you Sara! I’m thrilled with the room! Happy 4th! Kim I love it!! so bright and cheery! 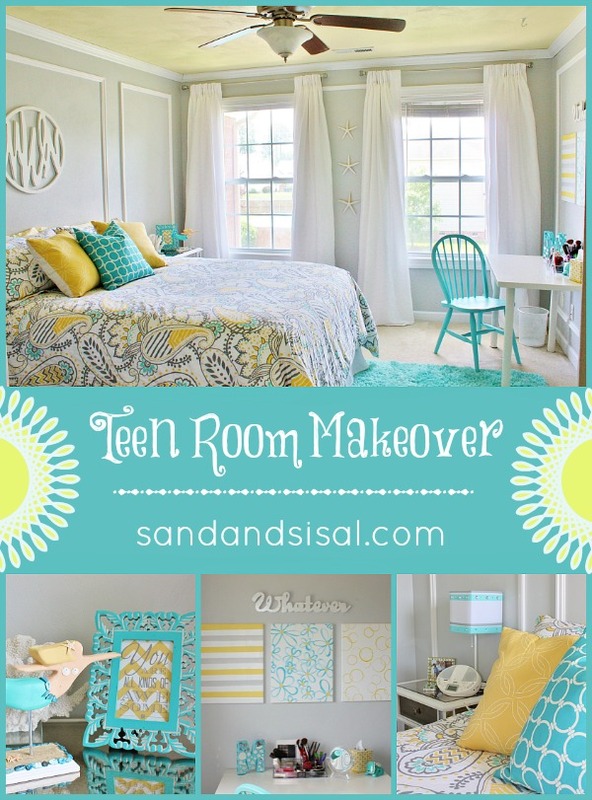 I loooove your teens room! I work at PBTeen. And the Ana Paisley is one of our favorites!! I am redoing my daughters room and that is what she picked!! I have to say you definitely did an amazing job!! Looks beautiful! What a special room for a special girl. What a gorgeous makeover !!! It’s the first photo that caught my eye at your party actually – just beautiful !!! you sure you didn’t give her the master? it looks huuuuge now! 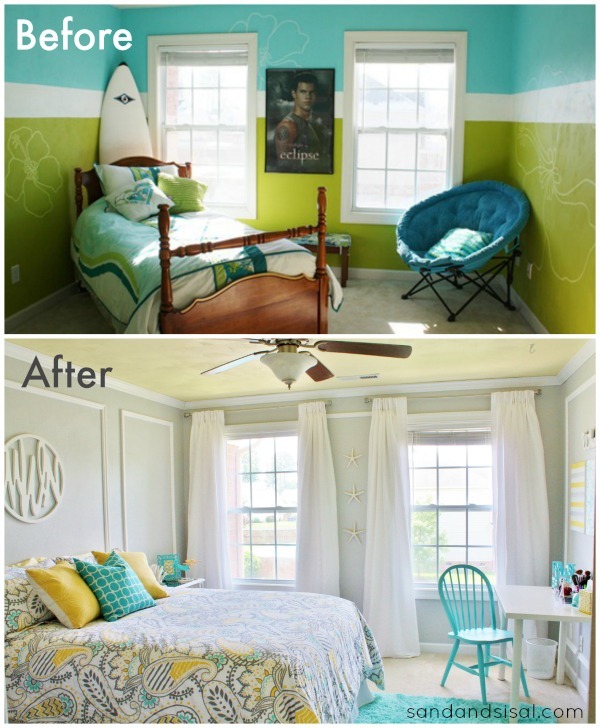 i was wondering how much the entire room makeover ended up costing! where is the blue pillow from? so cute!!! do you have any type of dresser in the room? My daughter’s room is set up VERY similar to this and I’d love to copy some of your ideas. My daughter doesn’t have a dresser but she does have a large 15 cubby unit from IKEA that we have baskets in for clothes. Would love to figure out how to get more of this look. Yes, just to the left of the beside table is a gray dresser. 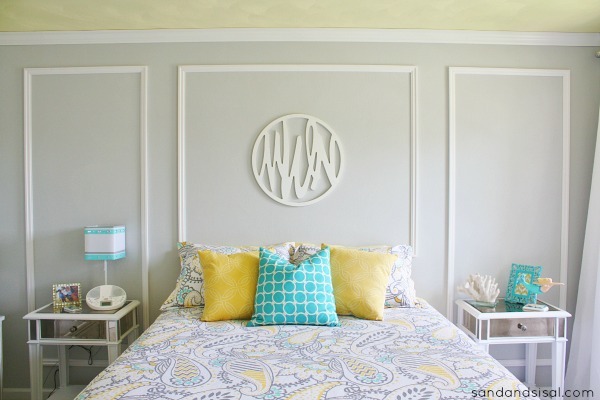 Here are 2 posts that show what it looks like and how I made over the dresser. 1) http://www.sandandsisal.com/2013/11/chalk-paint-dresser-makeover.html AND 2) http://www.sandandsisal.com/2013/11/how-to-use-soft-wax.html The dresser is not photographed in my daughter’s room though, but at least you can see what she now uses.